This route is accessible to many bikers with no particular technical difficulties, much of it on a paved or cement road, with only one stretch which can at times be treacherous. This itinerary can be done all year round with a distance of 30 km and an elevation gain of just under 500 m. There are steep gradients on both the uphill and downhill runs, always on good terrain apart from the descent from Laghel towards Ceniga. This section, on a steep cement track at the start, can be slippery, particularly when when or when there are leaves on the ground. At the end of the cement stretch, the surface is quite loose and conditions depend very much on the weather. Along this itinerary, you will pass through a number of historic town centress where route signposts are not allowed. Unless you follow the route with a gps system it may be difficult to find your way on some parts of the route. The trail begins in Viale Rovereto in Riva del Garda, in the car park at the Fire Station, to be exact. Turn into the cycle path heading north, and follow it as far as Varone. Near the town, the cycle path is interrupted and after a short stretch of mixed road you come to a stop sign where you keep right in the direction of the church. You will find no directions in the town, but it is easy to figure out which way to go. When you come to the church, the road bends to the left. Follow it, leaving the church behind, and at the next fork, you will find that your lane takes you towards the right. Keep on for a short distance as far as the stop sign at the junction with via Venezia. Here you turn right, following the road, until you come to a crossroads with traffic lights. Keep to the left here and keep on straight until you come to Ceole. 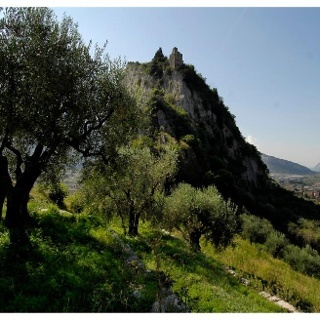 Here you will find the signpost for route 749 which takes you to the right as you continue down via Dante Alighieri towards Arco. Follow the road past the church Santuario Madonna delle Grazie, and at the next junction keep to the left. You continue on for about 400 metres on the main road, then turn left. Keep on straight until you come to the town of Varignano. Keep to the right past the church and, shortly after, turn left. Follow directions until you come to the town of Chiarano. Keep left here and cross the town centre, then turn onto via Al Monte. Here the road rises steeply and takes you up into the olive groves. Signposting is very clear on this section and takes you to the outskirts of Arco. When you reach the crossroads at the Arboretum, follow directions to the left and you will find yourself heading uphill towards the castle. You are on a paved road again and you will find the gradient quite stiff at times. When you come to the church of Santa Maria di Laghel, continue on straight on via Laghel di Sotto for a little over 1.5 km. Follow directions and turn right onto a dirt road, flat at first, which then heads downhill with some cement stretches. 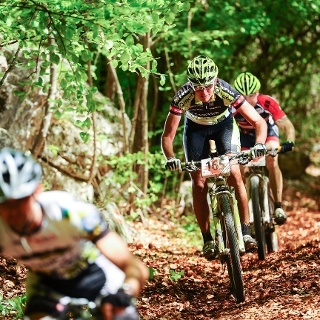 At the end of the downhill stretch, turn right at Maso Lizzone and you will soon come to the Roman Bridge of Ceniga. Cross the bridge and follow the narrow lanes of the town towards the church. Take the road at the side of the church. Keep left at the next fork and go straight on. When you come out of the town again you will be cycling through vineyards, then take an underpass to take you back onto the main road. Take the little country lane directly in front of you which leads you across the fields. The signposting is very clear here once again leads you along quiet country roads as far as Moletta where you come onto the main road again. When you come to the stop sign, you can continue on the left-hand side of the road, continuing on the footpath for a short distance. Now turn left onto a side road going gently uphill. 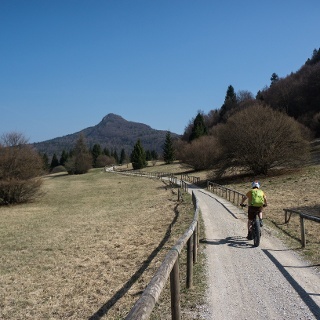 Continue on straight to the lovely medieval village of San Martino and cycle through the centre. As in other historic centres, you will find no signposts for your route. Leave the village on via Maffei, keep on left in the direction of Massone. At the second turn-off, turn right onto via Europa. You will come to a junction at a little church where you must keep right and go on straight until you come to a flyover on the main road. Cross it and you will soon come to the town. You are practically back in Arco at this stage. When you come to Viale Rovereto, keep to the left and follow the main road for a short distance. At a little roundabout, turn onto the cycle path on your right. From here on you have clear signposting once more as you cycle along the River Sarca on the cycle path as far as the mouth of the river at Torbole. 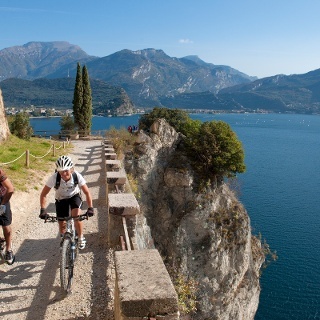 Keep right here and follow the northern end of Lake Garda. 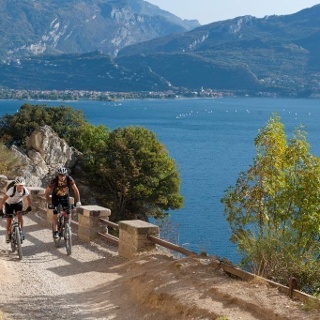 Follow the cycle path past the Brione promontory and continue along the beaches towards the centre of Riva del Garda, the point from which you started. Free parking in Riva del Garda at the old hospital (via Rosmini) and the old cemetery (Viale D. Chiesa). Pay parking at the Public Gardens Porta Orientale, Roman Baths, Viale Lutti (Ex Agraria), Monte Oro, shopping center Blue Garden. Sehr schöne Tour. Ja die Abfahrt ist anspruchsvoll aber die ersten 100m sind beinahe schon flowig.